Delurk Gallery Celebrates our second year! The month of April is one of renewal. We had a great winter and our member artists have been in their studios, many of them recent additions have put together a compelling show including work from everyone and featuring the work of Chad Beroth and Patrick Harris, Chris Powers and Zac Trainor. Featured this April is a mural installation and exhibit reviewed in the Winston-Salem Journal. 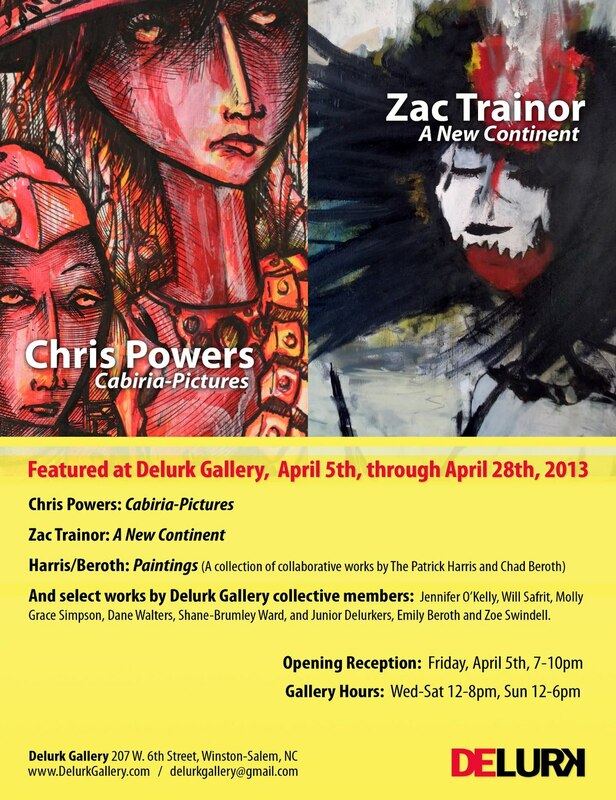 "...in the Arts District, Delurk Gallery is worth a visit this month, especially to see Chris Powers’ small solo exhibition consisting of a mural and 10 drawings that center on a Buddhist theme. Dominating the fiery-colored mural at the right side is a striking image of the Buddha serenely meditating alongside a distracted-looking, waiflike female figure wearing a floppy, crown-like hat. Other drawings and parts of Powers’ mural feature similarly stylized figures whose robes and headgear resemble those worn by European monks and nuns. Two of the drawings depict sexual couplings based on traditional Tantric Buddhist imagery. Also incorporated into the installation are ritual items associated with Tantric Buddhism." Here's an excerpt from a recent article by Tom Patterson, published in Winston-Salem Journal and Relish; Full Article and Image. "The themes treated in the adjoining duo show by Chad Beroth and Patrick Harris are more contemporary, grounded in pop culture, and the best of them have something of the same graphic punch as Powers’ work. What makes their works of special interest is that most represent joint efforts, combining two (or more) contrasting styles. My favorite is a diptych portrait of Abraham Lincoln that’s half pop art and half traditional realist portraiture. 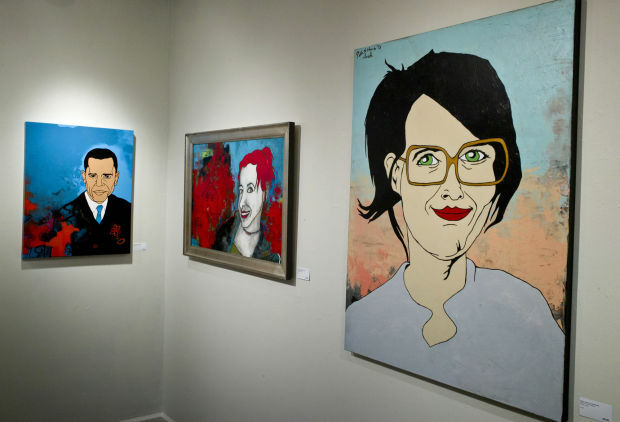 Other subjects that the two artists have collaboratively treated include President Obama, artist Jean-Michel Basquiat, Star Trek’s Mr. Spock, a kid in a Batman costume and several menacing animals." We are constantly in a state of push and pull, between our passions and instinct and the reality we have so exuberantly imposed upon ourselves. Drifting  through life, we are separated by imaginary lines that perpetuate the idea we  are all on our own and we must not concern ourselves with the trials and  tribulations of others or other countries.   We are all people. We are sedimentary compositions of our past. We are plates moving imminently towards our future. We are the earth and all that is inherent within and we need a new continent to wipe the slate and start again.  About Plates  Plates is an examination of the process, both in my art and physical self, that I  have undergone in the last few years. I started having episodes where a  pressure would be in my abdomen, numbness in my hands, feet and jaw,  lightness in my chest and head, and in some instances I would pass out. I  started going for tests, scans and consultations. In the end, most of it can be  attributed to anxiety and I have learned to have a more careful approach to my thoughts and actions.   I requested copies of all the scans and images that were available from my tests, and sorted through them looking for parts of myself that I connected with  beyond the bone and tissue. These plates are those images, cropped square  and printed on PVC media, that I then painted on. While they appear thin and  possibly as prints at first glance, they are in fact millimeter thick paintings.  Every one of these plates are a piece of me. A piece of my body and a piece of  my mind.